One of my favorites crystals is Amethyst. I think it's the color that attracted me to it first The way the light hits a cluster is so mysterious and mystical all at the same time. I use it to cleanse my jewelry. Simply place one or two pieces on a cluster, leave it to do its magic for 24 hours and hey presto, clean as a whistle! I don’t know exactly how it works, but energetically anything I leave on my cluster always feels as if it has just been through a wash cycle. I have Amethyst dotted around my office. A cluster sleeps next to my computer to cleanse the energy coming and going from it. I feel intuitively that it's about the color. Most Amethyst is a rich violet, the color of change, so whenever you want to go through change or you need support as you tackle the energy of change then carry a piece with you or pop a piece inside your bed pillow. Amethyst was once considered a precious stone. It's known as the “Stone of Spirit,” mirroring the color of the crown chakra - our doorway to the Divine. Amethyst is used in Mala beads as a meditation tool in Tibet and is said to calm, protect, and cleanse the spirit. Its color strengthens the muscles of the eyes. Gazing into an amethyst sphere will exercise your eye muscles, it really works too! I tried this many years ago when I was having some eye problems and it was so successful that I ceased to wear glasses. I got lazy though and haven't worked with Amethyst this way lately, hence why you'll see me in my specs in some of my videos. I need to get back to Amethyst orb gazing pronto! Its name comes from the Greek word Amethystos, meaning to be sober or not to be drunk. There are two stories linked with Amethyst, here is the least violent version. The tale reveals the love of Bacchus the God of Wine for one of Aphrodite’s nymphs named Amethyst. Problem was Amethyst didn't fancy him. She got tired of his advances and begged Aphrodite to help curb his enthusiasm. The Goddess of Love granted Amethyst’s wish and transformed her into a beautiful clear quartz crystal. Beside himself, Bacchus poured his cup of wine over the top of the crystal - making it change color - and vowed never to drink again. That's probably why it's associated with sobriety. In Greece, goblets were made from Amethyst with the idea that they could beat drunkenness. Now there's a different perspective for you. These days it’s a different kind of spirit that Amethyst works best with! Amethyst is a stone of transformation, healing and cleansing. It is known for its ability to help release addictions - hence the story. It's violet color raises your vibration turning your thoughts to service and what you can do for others. Little side note here; those born on the violet ray are here to be of service. One of the best ways to work with the Amethyst mojo is to wear it. Wearing Amethyst brings peace and calmness to my soul and is especially effective when made by someone that is a healer - like me. I wonder what it does for you? Do let me know in the comments below. Amethyst is also a protective stone - remember it transforms energy so anything coming at you will get kicked right out of your space. Right now I am sleeping with one of my tumbled Amethyst stones tucked safely into my pillow. I wake up feeling more relaxed and in tune with my intuition, always a good way to greet the new day right. It's really a great stone to have anywhere in your home or work space. Have it with you next time you take a shower or bath. Invite it to do what it does best and see how you feel. Amethyst is of course a great stone for a spiritual teacher, it helps you to find and access your truth, connect with your Higher Self, and then somehow dissipates the fear that can go with sharing your wisdom. 1. Place in the corners of your home and office to protect your energy and space from negativity. 2. Add to a crystal grid when you're ready for change or if you need help to smoothly move through change. 3. Pop a piece under your pillow to cleanse your energy overnight, stimulate intuition, and encourage healing abilities. 4. Improve your eyesight by gently gazing into an Amethyst orb. 5. Make a healing gem elixir. You can see in the picture above that I use a glass tube to hold the crystals, leave in my water and sip on it thoughout the day. 6. 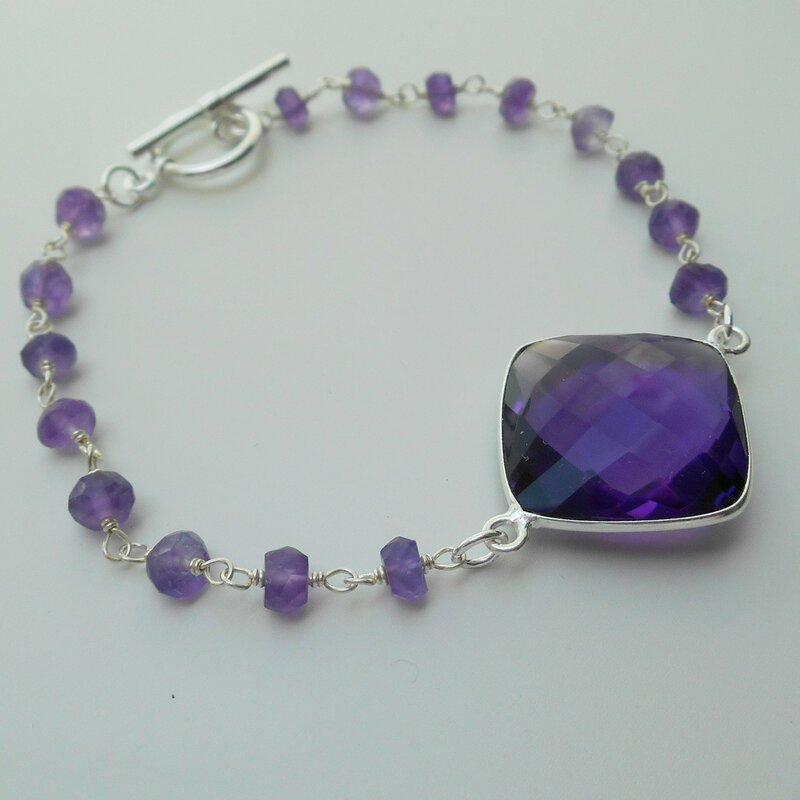 Wear Amethyst jewelry to take advantage of it's healing, spiritual and cleansing powers. 7. 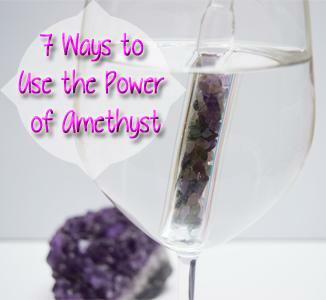 Place jewelry onto an Amethyst cluster for cleansing and energizing. * I would LOVE to know your experiences with Amethyst and what you use it for. Please share your stories with me in the comments below. Sheron Tucker I have a raw and a tumbled Amethyst. I have put the raw one inside my pillow case and the tumbled one I have put in a little circular swirl pendant case to wear around my neck or wrist. Only done it today because I have been feeling out of sorts for about a week while trying to put another business idea into practice. I am actually a really positive person. A happy go lucky Sagittarius. But lately I feel like someone is trying to sabotage my plans. So I am going to give it a try because it led me to this website and it's been on my mind for the last couple days for some reason. Thank you beautiful lady for sharing. My purpose is to heal and teach. ChrisAnn I am getting ready to paint a bedroom in my house that used to be my son's room. He is grown and an adult now. I went to a home improvement store to look at paint samples. I had no idea what color to paint this room. The very first color to catch my eye was called "Soft Amethyst". Purple has always been my favorite color. I believe that different colors bring different energies and feelings. I have chronic depression and anxiety that I struggle with on a daily basis. Prior to going to pick out a color for my room, I kept saying I wanted a room that was peaceful and calming for me. I can't wait to get my room painted. I'm certain this is the color I need to help me cope with my depression and anxiety. Thank you for the information. Daniel I once heard that this magic beautiful gemstone crystal if cleansed properly you can programme it to a positive energy of your choice. Anja Hello all... Is there a particular type of amethyst that should be used for clearing and cleansing other stones? I have found a nice slab of chevron amethyst that I'd like to use for displaying crystals. The purpose would be to clear them as they sit.... It is a flat and smooth piece, not a cluster. There's also one that's polished. Will this resonate with the stones I it holds? Just wondering how this works. Thank you! recently purchest an amathest rock secondhand ,is that ok? since then ive not felt the same ,i heard amathest is a healing stone and im hoping it can clense" me of negative energy "
or help bring confidence in life . Kimberly Bertone Is there a difference in using a raw Amethyst, vs. a smooth or tumbled Amethyst? Sanguine Hartzenberg Am an Aquarius. .birthstone Amethyst. Thanks for the information! ! Muchana Hi Elizabeth, thanks for the information about amethyst. Can you imagine we have a money full of these stones and I don't know that it has such powers. All we know it's for beautifying jewelry. I'll share the info to my family so we can use it in those 7 ways. Thanks again. Miguel These crystals honestly have a super out of this world feel! Truly Amazing! Another one of Mother natures and the Universes beautiful gifts for us all!! I just began my journey into meditation using crystals, and am always amazed at the different vibrations I get when I’m purchasing a crystal. I recently bought a very nice large piece of rough amethyst, and began reading about it of course. I don’t use the crystals for HEALING, as that would go against my religious beliefs. However, I’m always open to anything that benefits my spiritual life. In my most recent part of my meditation journey, I incorporated ‘sleep meditation’, and the first of my crystals I thought to use was amethyst. I cannot begin to explain not only the vividness of my dreams, but the calm energy I felt when I woke for prayer. Ironically, I am being forced to leave behind someone who has grown quite dear to me, and it’s not an easy separation. I think the amethyst helped me last nite through the dream I had of him. It was so vivid. I love your informative way of explaining the properties, and would love to read more. Thanks so much! Good karma!! Trina Stanfield I recently bought an amethyst necklace while on vacation on a whim. I didn't notice until about a week later but everything was going my way, everything! I felt calmer and I was currently looking for a job in another state which I've had no luck within the past year. All of the sudden in one week I received five replies to my resume and now I actually have an employer flying me to another state for an interview. I just gave notice to my current job of 11 years partly due to the boss and our inability to get along. I feel protected and I feel like nothing can stop me now. Finally! 11 years later! I will cherish my amethyst forever! Debbie sherlock My daughter bought a few $2 necklaces for herself and she gave me one a couple of months ago. Since then I have had a very positive emotional time. Which has impacted on several aspects of my life. I am about to start a new job which will be demanding for me. So fingers crossed! Jeremy I have a crystal and a ring that can be opened and filled.Will amethyst's abilities work if I melt a piece of the crystal and put it in the ring? Lynn Years ago in high school a car load of us kids were in an accident. Everyone got hurt pretty badly and I didn't even get a scratch. I was wearing my amethyst guardian angle pin that my mom had gotten me for my birthday. I've always said it was that pin that saved me. Diana Rangel I'm usually skeptical about things like this but I had a very vivid dream about someone I've been enamored with. I'll never see him again and there was no closure or formal good-bye's. I have re-occurring dreams about him and in the most recent we came upon a cave or grotto of sorts full of amethyst crystals. They were on the walls, floor, ceiling. There others there meditating and candles lit up the place. I felt the calm energy but it made my male friend uncomfortable and he whisked us away. I felt confused and sad that we left so abruptly. I'm trying to find the meaning of the amethyst and I think I found it here. So thank you for that. Nicki My crystal flew off a shelf in my bedroom. I say "flew" because it didn't just fall and there is no plausible explanation for what happened. I'm a very sensible person. Any thoughts? Daniel I place amethyst polished crystals on top of my mini speakers when hearing music, <3 makes me feel so much more. Thank you for this beautiful post. Paul I brought a large ring in Vietnam that had an amethyst in it. I wore it some after coming home and just this yr, I finally gave it to a sister like friend of mine and now I have found out why I long ago stopped drinking and smoking weed. I haven't had the desire for weed for so many yr's !!! I thank you for the story !!! I had a experience with amethyst on my way home tonight. I was driving home late around 11:30 and was worried because I felt myself getting too sleepy behind the wheel. Earlier this morning I bought a small amethyst pendant from the store I work at and have been wearing it all day. While I was driving home and was feeling as if I could fall asleep at the wheel, without thinking I started to slowly rub my pendant (by habit) and I actually felt a flow of energy immediately. I was wide awake for the remaining 15 minutes of my drive. Was this my amethyst? Is it a stone that stimulates energy as well? Or does this reaction have nothing to do with amethyst? Brandy Ive been feeling very intuative lately. So much that It all just clicked Im on the road to Happiness and lowband behold i look in my grass in the middle of the yard and find a beautiful amethyst. Which brought me to this site. Thank you very helpful. Somehow its like I knew what it was before I even looked. gopinath This is useful post for me iam having the amethyst stone around 160g just give me some idea how to place perfectly. Elizabeth Shefali, it might be helpful to place Amethyst under your pillow so it can support you during your dream state. Go to bed with the intention of clearing those past energies. Marla I have multiple personalities and I always wear my amethyst necklace and it does keep the dark, negative things away. When I don't wear it, I change to a more negative person. Strange as it seems, it is so true. Thank you for the information. Stan Leszewski i never knew what crystals meant or how/what used for, i was drawn to purchase some in a NYC shop, and now i read the above information... I am experienced and work in addiction/recovery (drugs/alcohol etc..) i have had repetitive dreams in life that have come true , i have had deep gut feelings about people and happenings in life that were true, im learning some real things about myself that people including myself sounded crazy, impossible to believe, so now i have amethysts and albeit stone , i am yet to find out if anything comes of it..... thank you and everyone for sharing all the info!!!! God bless Peace and Love !!! Siri What is the Violet ray? Gabe My experience with amethyst initially was quite odd - the stone didn't help or resonate with me at all, and I ultimately had to destroy it for it had attracted a negative entity. Currently, I'm using a small piece of amethyst in conjunction with sugilite. The Sugilite is wonderful, and I'll see if the amethyst adds to its power as it should. Bobbi Catrina Ellis Which hand should I wear my Amethyst bracelet? And should I wear more Purple on my left fingernails than my right fingernails? Sherri I have always been attracted to purple so I have amethyst jewelry and polished stones around my home. I also have other semiprecius stones as well. Does amethyst work well with other stones or crystals and if so, which ones? I have a very painful and fatiguing disease called fibromyalgia. Which stones do I need to wear for relief and healing? And do my medications prevent them from working? Thank you for any advice you may have for me! Violet Hi, it says those born on the Violet Ray are here to be of service and my name is Violet and I got an amethyst necklace when I was seven so I'm going to try a few of your tricks. Ian HI. i like amethyst. Can i use it regardless of my birthday and/or zodiac sign because some says it only works for february people or other zodiac signs..thank you! Lilly Is it ok the buy second hand amethyst clusters / chunks? Minnich My birth stone is a amethist!! Trudi I bought a small cluster to keep near the chair where I sit in the evenings and I've been so positive and feel much better about life since. It has helped me definitely. DoN Roland I bought one amethyst stone, then another raw stone, then I got this cluster of seven that I'm now about to send to my closest friends for they can reap the benefits I'm loving every single day. Point is that my art and music has skyrocketed to new heights that scares me sometimes, I wanna pass these out to everybody. Very informative thanks. I got one last tuesday. Smriti Very informative post. Amethyst also helps one remember the relevant dreams. Gargling with water that's purified with amethyst crystals helps relieve a sore throat like magic, even minor wounds on pets heal super fact when amethyst crystals are wrapped in muslin cloth and gently placed over their wounds. My cats almost always sleep near the amethyst geode , no wonder they are so intuitive?? Janet Thank you Elizabeth ..Loved this post ...?